Identity crisis. 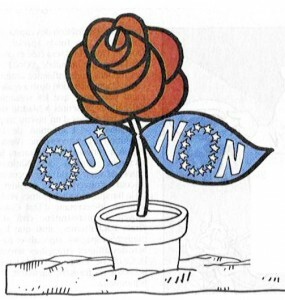 The Socialist rose as seen by Plantu in spring 2005. 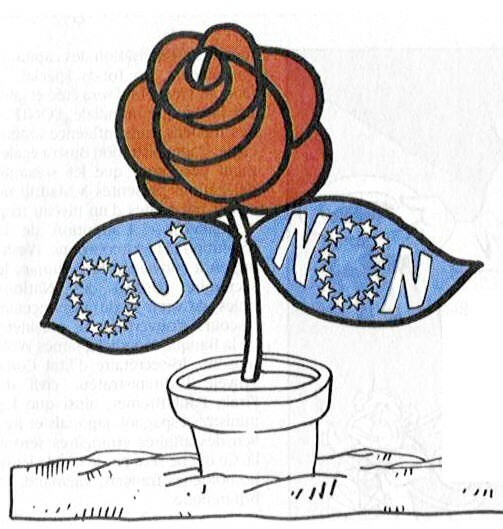 On a study trip to Brussels about fifteen years ago, a major French socialist MEP gave a good lesson in French political semantics to my student group. In a nutshell, she explained that she and her group were perfectly at ease working with all the Social-Democrats from Germany or Sweden and elsewhere, as well as with colleagues from Labour in Britain or the Netherlands etc. As a matter of fact, she said, the French MEPs from her group actually were‘ social-democrats’ in all but name. And the she concluded, with a sigh: ‘But if we said so at home in France, we’d get lapidated in no time’. In January 2017 the French Socialist Party is probably in its worst state ever since I’ve been actively following French politics (and that’s a worryingly long time already). Over recent weeks I have not met with anybody who does NOT think the primaries organised by the socialist party are close to irrelevant. The question is even no longer whether the winner of the primaries might have a chance or not to make it to the second round, but whether he (and it’s revealing there’s not even a credible ‘she’ in the line-up) will finish a humiliating fourth or fifth in the first round, distanced not only by Fillon and Le Pen, but also by two men who left their socialist past behind. Jean-Luc Mélenchon was an active member of the Socialist Party in 1976 to 2008, before demonstratively leaving a party he considered no longer in line with leftist convictions. Whatever one may think of his demagogic temptations, sour aggressiveness, and paranoid Germanophobia, one must recognise he is coherent. And credible over time. (And a brilliant public speaker, too, by the way). Now that he more or less managed to incorporate what is left of the Communist Party into his movement La France insoumise (‘Unsubmissive France’), he will be a serious contender and make sure his voice will be heard throughout the campaign. Emmanuel Macron, never was a member of the party, but owes to the years he spent in Hollande’s Socialist government much of the limelight he is currently enjoying. Like Mélenchon (but without saying it out loud) he considers French Socialism as has-been, whose leaders have been unable to decide what they actually stand for and who as a result neither have Mélenchon’s guts and ideological coherence nor pragmatic solutions for the challenges of a world that no longer fits into their traditional patterns. Mélenchon and Macron are the proverbial ‘rock’ and ‘hard place’ between which the Socialist Party finds itself in early 2017. In other words: they are flaring red warning signs of implosion. In 2005 the referendum on the EU institutions revealed the sheer depth of the dividing line along European integration and globalisation that runs through the party. I was dumbstruck to see just how much many of my friends, colleagues and neighbours with leftist sympathies virtually despised ‘what Europe had become’ and violently condemned the German term ‘social market economy’ as an essentially dishonest oxymoron. In the opposition years up to 2012, the Socialist party wasted the chance to make up its mind about Europe and globalisation and opt for a coherent doctrine. Instead the party preferred to stick to its perfectly contradictory obsessions with both national sovereignty and the usual lip service to European integration. Timid tentative discussions about a possible change of name – from ‘Socialist’ to ‘Social-Democrat’ – were quickly dismissed as secondary or premature by some, and as high treason or blasphemy by others. There was a fixation on keeping truly antagonistic positions under one roof. The ‘pluralist left’ (‘la gauche plurielle’) of Lionel Jospin – punished by many socialist voters in 2002 for ‘not having been leftist enough’ (‘pas assez de gauche!’) as I was told many times – has in the meantime turned into what Manuel Valls recently called ‘the irreconcilable factions of the left’ (‘les gauches irréconciliables’). In his years at the helm of the party, François Holland even took pride in calling himself ‘the man of the synthesis’, as if fifty shades of rose could coexist forever without any clarification what the base colour was. There is a price to pay for always refusing to reconsider basic assumptions and binding doctrines. For not having a Bad Godesberg moment like the German Social-Democrats, who in 1959 got rid of hypocrisy and absolute truths of Marxist obedience. (True enough, this was easier for them with the East German scarecrow in sight). The French Socialist Party will not disappear overnight, and observers will be well advised not to underestimate the legitimacy a big party with a great tradition can endow a candidate with, nor the loyalty it is able to command in a national election with high stakes. But chances are 2017 will be seen as the moment when the PS started its slow slide into irrelevance. Is the French party system then moving towards a ‘quadripolarisation’, as Thomas Guénolé recently put it in a quality interview with the Figaro? In Spain, this is what seems to be happening – and the loser is: the Socialist Party! In France, it could be even worse: a four-party system with two extremes and two moderate visions of society, one of which would be of Gaullist and Christian-Democratic obedience, and the other of Liberal inspiration in both economic and societal preferences. The challenge for the PS is now threefold: a) survive the presidential election without ridicule; b) limit the damage in the legislative elections and form a relevant and respected opposition in the parliament; c) sit down and define who you are and who you want to be. 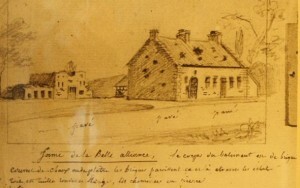 The Belle-Alliance (sketched by Tardieu in June 1815). They don’t seem too optimistic about it themselves. In an attempt to sound inclusive and brighten up the primaries, they named them ‘Les primaires citoyennes de la Belle Alliance Populaire’. 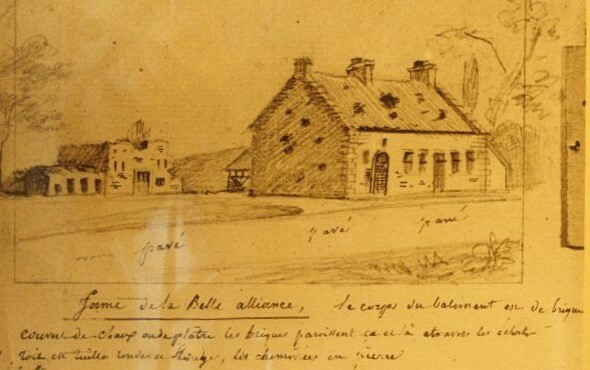 Spontaneously, ‘Belle Alliance’ reminded me of the name of a modest country inn which had the misfortune to be located on the battlefield of … Waterloo. A subliminal premonition? This is post # 10 on the French 2017 election marathon. This entry was posted in Current Affairs, Democracy & Citizenship, Politics & Public Policy, Society & Culture and tagged democracy, elections, France, France 2017, French elections, French politics, French Socialist Party, left, socialism. Bookmark the permalink. Previous: France 2017: Two years on, how Charlie can you be?